Indexed I/O offers users easy and intuitive document redaction tools. With the addition of the Indexed I/O redaction tool set, users can easily select privileged of confidential information and redact it from the document. Within the user interface all redactions are semi-transparent which allow for easy review of the item without toggling or removing the redaction. 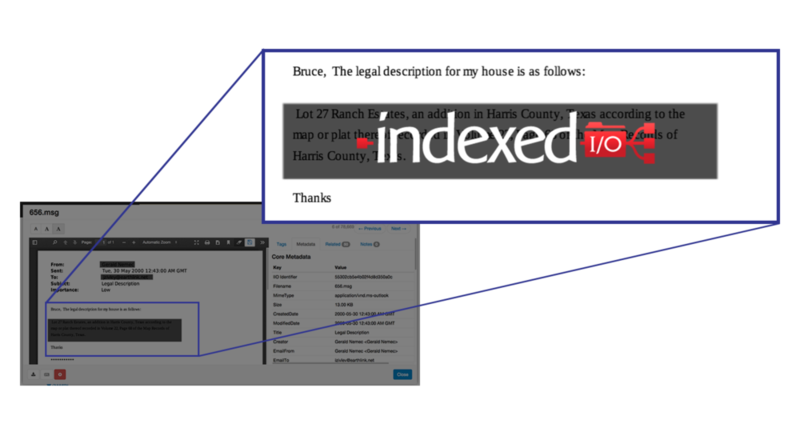 Combining Indexed I/O’s ‘personal information’ detection (a standard feature in our eDiscovery processing that auto-detects personal information like Social Security and Credit Card numbers in the document text) with our document redaction tools, our users can efficiently, and consistently handle privileged information. Redactions are OCR’d and saved in real-time, making them immediately available for export or printing! NOTE: When an item is redacted it is immediately OCR’d. In addition to the original text, a new associated text file is created and utilized upon all export events. This ensures no redacted content is ever produced or exported from the system! With an easy and intuitive interface, legal teams can quickly learn and utilize Indexed I/O in a matter of minutes. With no software or hardware to purchase, a ‘pay for what you need’ model, and no-long term restrictive contracts, Indexed I/O is by far the fastest, easiest to use, and cost effective eDiscovery solution on the planet. Indexed I/O makes eDiscovery easy.